Pregnancy is a time when cravings can strike full force, and if yours are causing you to reach for a daily candy bar, it’s best to be prepared to fight them. Consuming too much refined sugar during pregnancy can lead to weight gain and diabetes, which exposes the developing baby to large amounts of sugar in the womb. A baby getting too much sugar produces too much insulin both in the womb and after birth. This is where problems arise, since after birth there is no longer a sugar supply being provided by the placenta. The baby’s sugars drop too low, necessitating early feedings or even a glucose drip or feeding tube placed into the stomach to elevate the newborn’s blood sugar. Gestational diabetes can also put both mother and baby at increased risk of developing diabetes later on. Luckily, there are many strategies that allow a craving-stricken woman to satisfy her sweet tooth without compromising her or her baby’s health. Here are five sweet treats that offer healthy nutrients and fiber to keep your blood sugar and weight gain under control when cravings strike. 1. 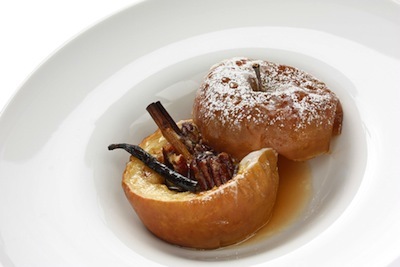 Baked apples: Core apples, then stuffthem with raisins, cinnamon and nutmeg. Bake whole, cored apples at 350 degrees F for 15 minutes. 2. Frozen fruit: Blend your favorite fruits such as antioxidant-rich berries and potassium-rich bananas and then freeze them in a Popsicle mold. If you don't have a Popsicle mold, fill paper cups halfway with your blended fruit mixture and then add wooden craft sticks before freezing. You can also make frozen yogurt popsicles with the remains of a healthy fruit and yogurt smoothies, or purchase all fruit popsicles from any grocery shop. Even easier, just throw some grapes and bananas in the freezer and enjoy them as a frozen treat that lasts! 3. 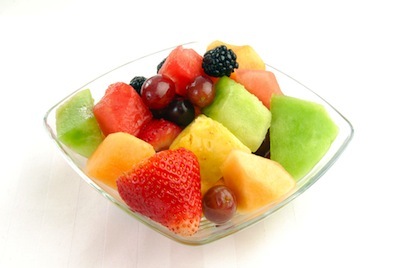 Fruit salad: Give your taste buds a treat by mixing a variety of fruits with a squeeze of lemon and a pinch of sugar. Or try sugar free vanilla pudding or yogurt mixed with interesting fruits such as kiwi, mandarin oranges, raspberries and cherries. 4. Dark chocolate: this type of chocolate is high in antioxidants and has been shown to help prevent tooth decay, type 2 diabetes, heart disease and depression. Dark chocolate is still a high calorie food, so you shouldn't eat a lot of it, but there is definitely a place for dark chocolate in a healthy diet. Have a square or two of dark chocolate each day to beat sugar cravings. Chocolate covered strawberries are another way to get your chocolate fix plus added nutrition from low calorie fruit. For maximum nutritional benefit make it a dark chocolate covered strawberry. 5. Frozen yogurt (in moderation): this is lower in calories than ice cream, but not necessarily sugar, so be sure to stick to the half cup serving size. This dessert is beneficial as it offers protein and calcium. Add half a banana to gain some nutrition and fiber plus some low calorie whipped cream for a banana split with half as many calories as the full fat version.